So… I was sent an advanced reading copy of the second book in this series, Allegiance. Five pages in, I was hooked. 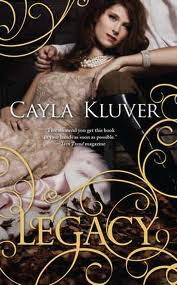 I hadn’t read Legacy yet and something kept nagging at me to read the first book first (brilliant, I know! )… so after becoming seriously hooked on the second book, I put it down ten pages in and downloaded Legacy. I cannot even begin to tell you how enraptured I became with this book! I inhaled it. I tried, and failed, to put it down in order to sleep. I finished it overnight, then began the second book again, finishing Allegiance by the next evening. I can’t wait for the final book, Sacrifice! What’s the big deal, you ask? There’s this girl. A Princess. Named Alera. She’s smart and pretty and has a great sense of self, and is coming to understand just what she is capable of as a human being. There are also these two guys. Narian and Steldor. Steldor is the Ego-driven jock of the story, amazingly handsome, smells irresistible; Alera is physically attracted to him and mentally repulsed by him. Narian is (to contextually quote the movie “Fools Rush In”) everything Alera never knew she always wanted. Narian’s got a sketchy past and there is impending doom on the horizon due to a prophecy surrounding Narian. Alera has to choose a husband by the time she turns eighteen and her father, the King, pretty much narrows her pool of eligible men to Steldor. What will Alera do? This story is like every little girl’s princess fairytale in writing. It’s what we girls all secretly (or not-so-secretly) dreamed of when we were kids, role-playing with Barbie dolls and tea party sets (admittedly, I wasn’t a tea party girl, preferring to spin around on hot wheels). There are Kings and Queens and horses, duty, honor and palaces and mystery and HOT men (amazing love triangle) and just a hint of magic. Get this book. I’m not kidding. If you enjoy a good Princess story you’ll love it! NB: The author, Cayla Kluver wrote and self-published this book when she was 16! Wow!